PCA&D students in last semester’s Type as Art class with Bill Dussinger were involved in the city-wide Litter Letter Project that aims to get Lancaster to consider litter, recycling and keeping the city clean. 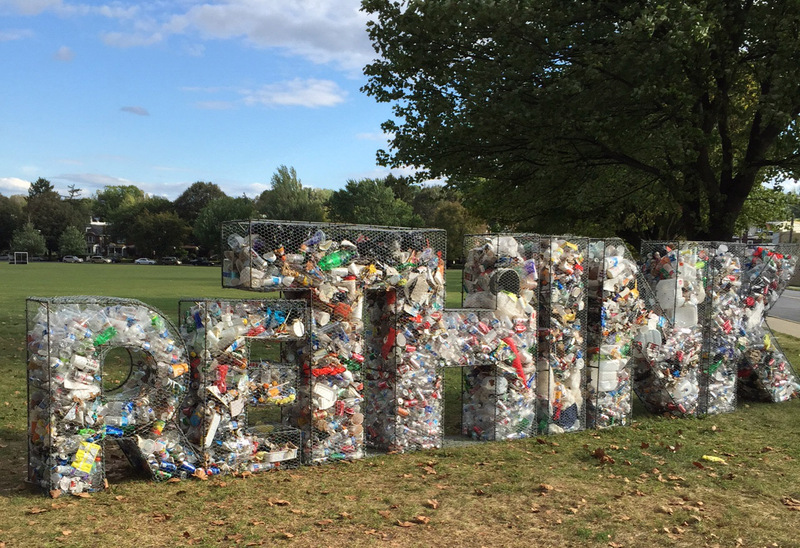 Recently the project came to fruition with huge letters, filled with trash, spelling “rethink” placed on the grounds of McCaskey High School. Huge letters spelling out "reTHINK" and filled with trash were placed on the school campus Sept. 12 as part of the Litter Letter Project to get the Lancaster community to consider the impact of litter on the environment and the community. The Litter Letter committee came to speak to the class supplied the students with the five words chosen by the committee. The students were charged with designing the graphic look of the letters. Students designed the type to be used for The Litter Letter project — a 3D messaging system of letters constructed from chicken wire and rebar, filled with litter collected from streets and parks. In addition to PCA&D and the Litter Letter Committee, the project involved the efforts of the City of Lancaster, McCaskey's Eco Club, Tait Towers, the Lancaster County Solid Waste Management Authority, Boys & Girls Club of Lancaster, Lancaster Unity, Isaac's Famous Grilled Sandwiches, Aikido Center of Lancaster, The Mix at Arbor Place, Franklin & Marshall College, Keep Lancaster County Beautiful and the Lancaster County Conservancy. This collaborative project hopes to raise awareness and educate on the impact of litter on our environment by displaying these messages in public spaces. According to the course description, the aims of the Type As Art class involves ”Taking typography above and beyond marketing and advertising; challenging each student to generate stimulating, contemporary art. A class that blurs the lines between all four majors, opening the art of type to all mediums and uniting us as artisans of the visual alphabet. Type as language, message, and museum- quality art. Projects will stress the importance of type selection, while addressing the issues of aesthetics, form, function, composition, style and message.